The new Dean of Peterborough has been announced as the Very Revd Chris Dalliston. Chris Dalliston is currently Dean of Newcastle, a post he has held since 2003. During his time at Newcastle he has overseen significant improvements in the Cathedral’s facilities for visitors and worshippers, and led a partnership with the City Council and others to re-invigorate the historic heart of the city. In March this year the Cathedral was awarded a major Heritage Lottery Fund grant as part of a £6 million project to transform the nave, renew visitor facilities and re-shape external spaces. Under his leadership Newcastle Cathedral has built partnerships with city institutions, including the universities, the other churches and faith communities. The Cathedral sponsors a Street Pastor project and a Night Church, offering itself as a spiritual sanctuary at the heart of the city’s night life. Chris was one of four faith leaders (Christian, Jewish Muslim and Sikh) to take part in an interfaith, intergenerational visit to Auschwitz in 2013. The visit resulted in an annual programme of interfaith events at the Cathedral. Peterborough Cathedral has suffered financial problems over the past year, but Very Revd Dalliston said he was looking forward to coming to the city, and celebrating the cathedral’s 900th anniversary next year. He said: “I feel deeply privileged to be asked to take on this role. Peterborough is a growing, dynamic city with a great future. At its heart stands this extraordinary Cathedral –without doubt one of the great buildings of England. There have been some difficult times recently, but there is here a team of people who are determined to rebuild confidence and a growing congregation that is excited about what the future can bring. 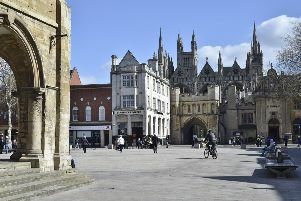 There is also a wider community who long to see this place, on the threshold of its 900th anniversary, not just as a powerful symbol of Peterborough’s illustrious past, but as an active participant in helping to shape its future. “I will do all I can, working with the Bishop and my colleagues, to help fulfil this vision and shape the ministry of the Cathedral to be a sign of God’s amazing love, grace and presence in the city, the diocese and the region”. Chris has his roots in the east of England. He grew up in Norfolk, studied at Cambridge University and served in the Diocese of Chelmsford for the first 12 years of his ministry. Before going to Newcastle he was Vicar of St Botolph’s Church at Boston in Lincolnshire (known locally as ‘the Stump’), where he oversaw a growing congregation and the building of a new church and community centre for the daughter church of St Christopher’s. The Bishop of Newcastle, the Right Revd Christine Hardman, paid tribute to Chris’s work in the city. She said: “For fourteen years, Chris has served both the Cathedral and the people of Newcastle superbly. His vision has been to establish the Cathedral’s place at the heart of city centre life, with a care for the most vulnerable and with close links to city institutions and businesses, as well as other churches and faiths. He is responsible for many improvements to the Cathedral and most recently has been leading our bid for Heritage Lottery funding to secure the Cathedral’s future as an inspirational place to visit and worship. Chris will be installed as Dean of Peterborough on Saturday January 20 2018, at the 3.30pm service of Evensong. He succeeds the Very Revd Charles Taylor who retired from Peterborough Cathedral in October 2016. Earlier this year Rev Tim Sledge was appointed as the new Dean of Peterborough - however, shortly after the announcment he said he had to turn the post down due to health reasons.